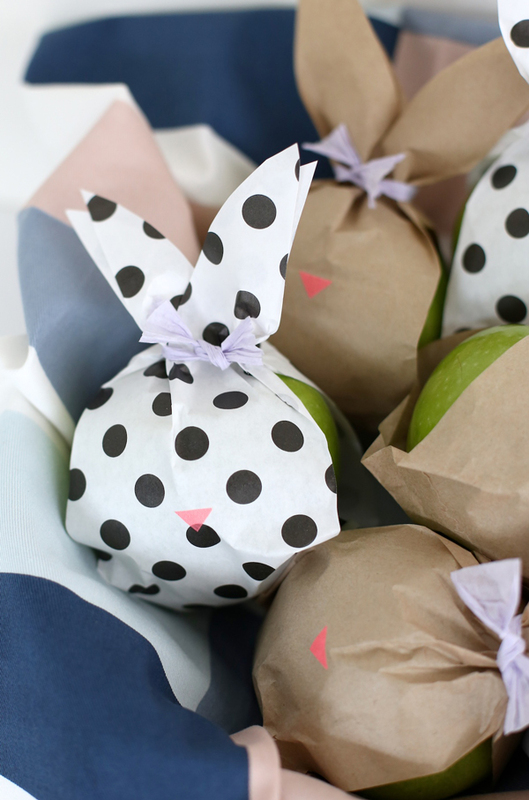 Bunnies are the simple (and cute) mascot for Spring, and they inspire these fun fruit bags. 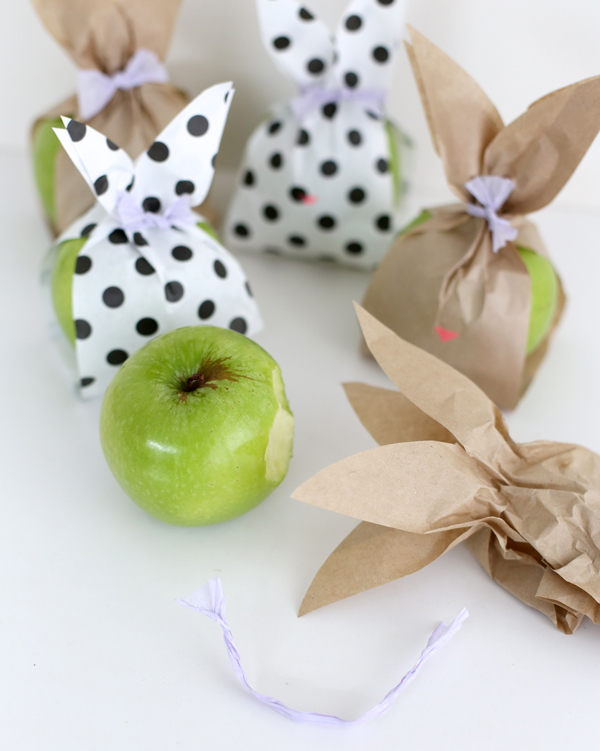 They’re made from paper bags and will instantly liven up lunch time fruits and veggies. Place a basket out at brunch and your guests will be instantly drawn to the tied ears, colorful nose and sweet peak of fruit inside. 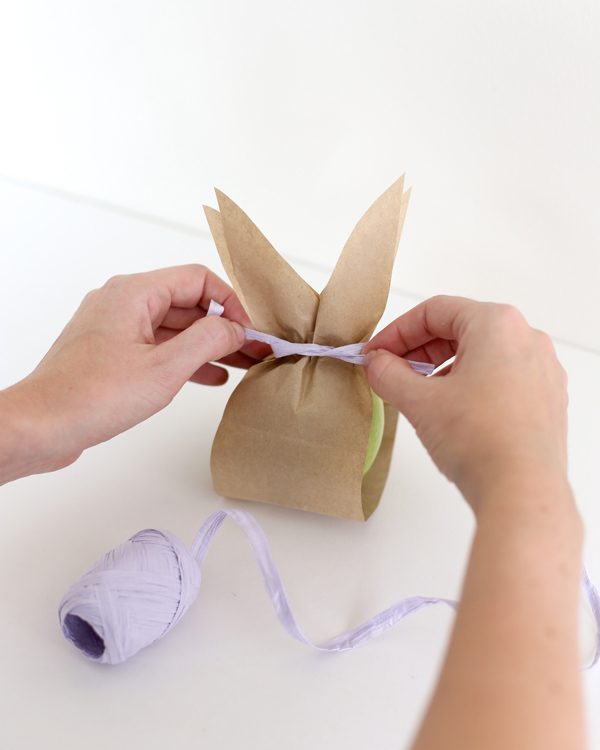 To make the bunny paper bags you’ll need; paper bags (look for fun paper bag designs at your local craft store), a roll of colorful tape, ribbon to tie off the ears, and fruit to place inside. 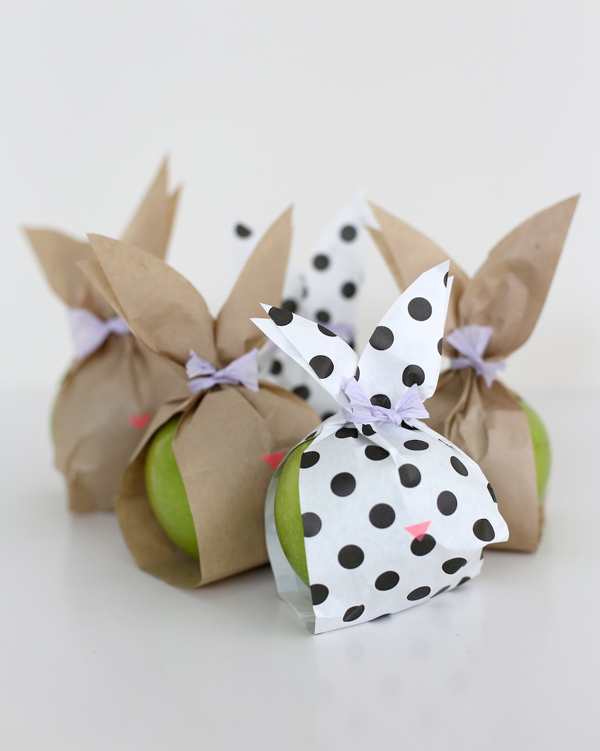 To make the bunny fruit bags, cut the edges off your paper bag so that you are left with two open sides. The bag should be cut to be a little narrower than your fruit. Cut the open end of the bag into the shape of rabbit ears, the ears should meet around a third of the way down the bag. 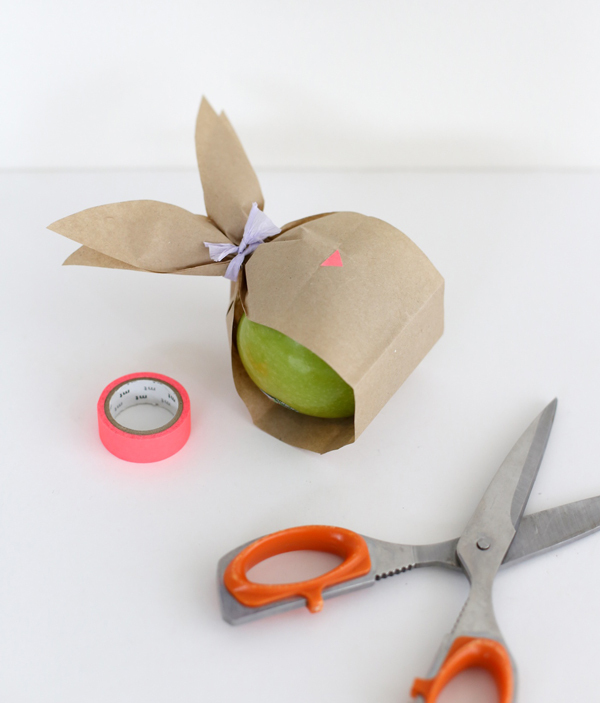 Sit the apple inside the paper bag and gather at the top, being careful not to tear the paper. 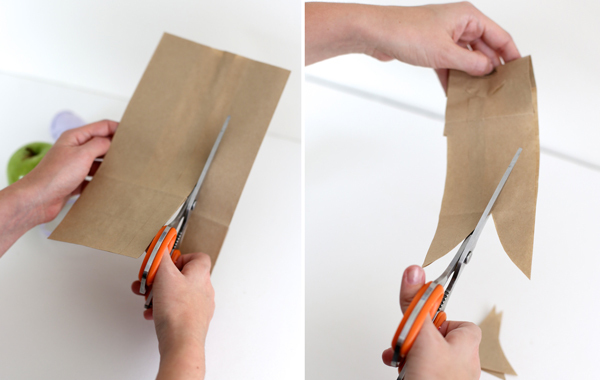 Fix the gathered bag in place with some paper ribbon, knot the ribbon twice and fan out the ends into a bow. 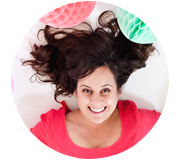 Cut a small triangle of pink washi tape and add it to the front to make a cute bunny nose. 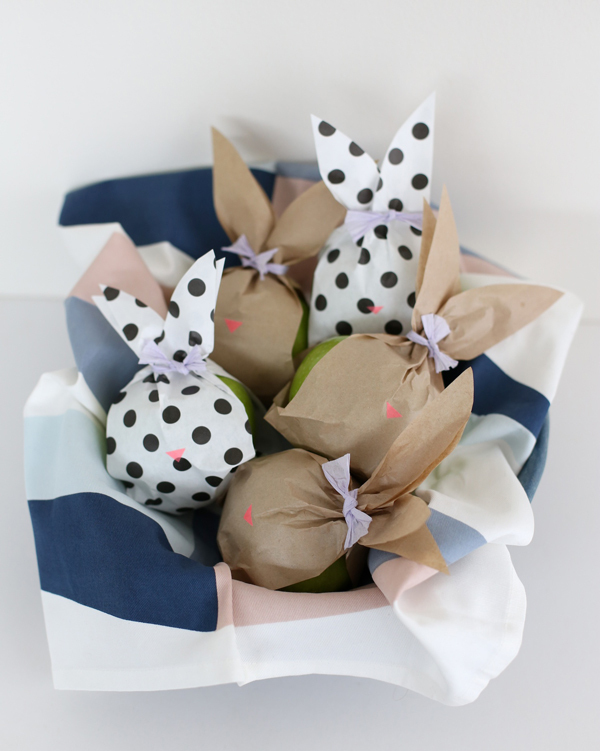 Use different patterns and colours to create a fruity Easter display — you could also use any type of round fruit or vegetable to fill these paper bunny bags. They look sweet in a bowl as a grab and go snack, and would make a lovely easter surprise inside a lunch box. Project design and photography by Claire for A Subtle Revelry. See more pretty photos from her at South by North. Oh my goodness, this is just adorable! Love it! Whoever gets these in their lunches are so spoilt – now I wish I had someone to make lunch for!